What do you do when the going gets tough? Do you push through the mental anguish, or do you give up? How does your choice affect the way you feel? How do you want to feel? How you do anything is how you do everything. If you procrastinate in one area of your life, chances are that you do it in other areas as well. Last night was night 7 in a string of “4 month sleep regression” nights. I had just gotten our 4 month old, Arlo, to sleep through the night about a week before, and now he sleeps worse than ever. In the past, I would have made excuses and taken a nap at the first opportunity, but I don’t want to be that person anymore. I want to create the life of my dreams, and I can’t do that if I’m napping every day! To the gym I went. I’ve started doing hill run intervals during the past few weeks, and each time I am challenged at the exact same point in my run. And each time I am happy to say, I’ve pushed through it. How? It’s all in your head. Set an intention, and you’re 99% there. Your goal is as good as realized if you have a big enough WHY, and the intention to carry it through. It’s how I got through 3 natural births. I just set the intention to do it, and although it wasn’t easy, I knew that setting the intention meant that I would come out on the other side in just a matter of time. How can you push yourself to run faster and longer? It starts with the intention. Ok, done. But how do you execute that intention? One step at a time. When I was enduring natural back labour, I took it one second at a time. One breathe at a time. Looking into the future or back at the past does you no good in the “right now.” There’s no sense worrying about having to run for another minute to finish an interval when you are working in seconds. It also helps to have a workout plan. If you’re flying by the seat of your pants then you’re planning to fail. 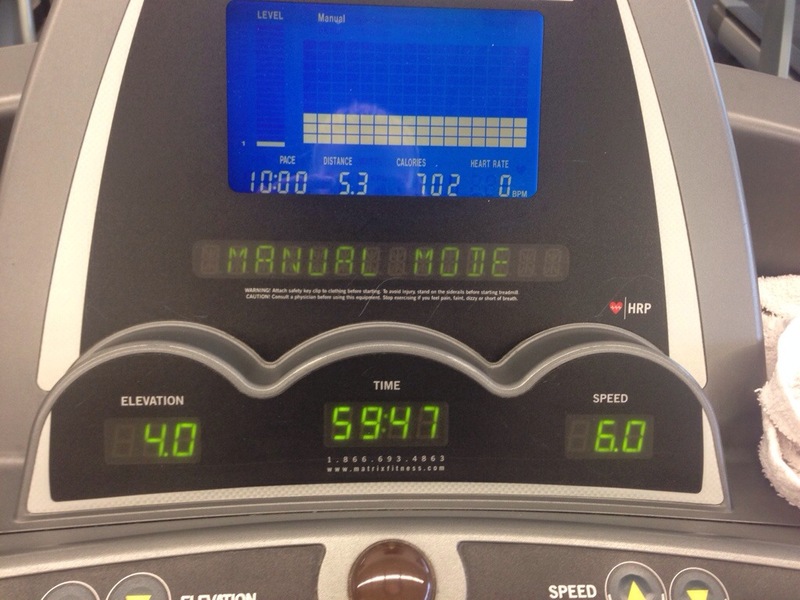 My go-to workout at the moment is Treadmill Trainer Volume 1. Every time I use this workout, there is a point where I seriously think about giving up, and every time Yuri comes on and says “Do not give up. You’ve committed to this interval so let’s finish it!” And every time it gives me that extra mental push I needed. Do you think I could run uphill intervals for an hour by myself. Heck no. It helps to have a guide. You have to celebrate your successes, no matter how small they may be, because doing so adds gratitude, excitement, and happiness to your life and invigorates your Spirit. Happiness is vital for the momentum to keep going. If you hate working out, you’re not going to get very far with your goals. Find enjoyment in the process! Don’t get comfortable. Break through your ceilings, again and again. Push yourself to get to that next level. Don’t leave the gym thinking that you could have gone harder. Put in the work and celebrate your successes as they come! Be grateful for your ability to push yourself and be grateful for the benefits as you notice them. For instance, you may notice that it’s easier to get up off the couch, you can lift your kids easier, it’s easier to breathe, you can breathe deeper, you’re happier, the people around you can feel it, and they’re happier because of the energy you’re bringing home.